This build is looking great! 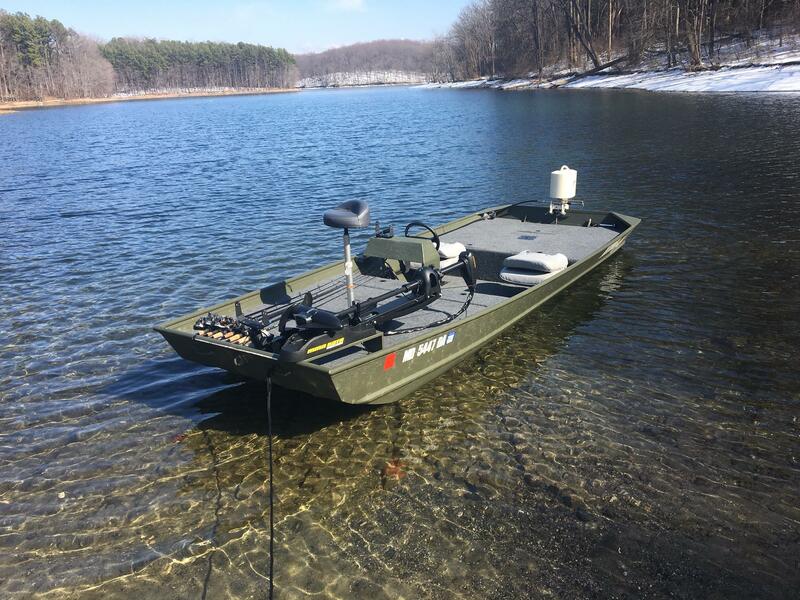 I actually live in MD and have a boat for the reservoirs as well, this site has been extremely helpful... 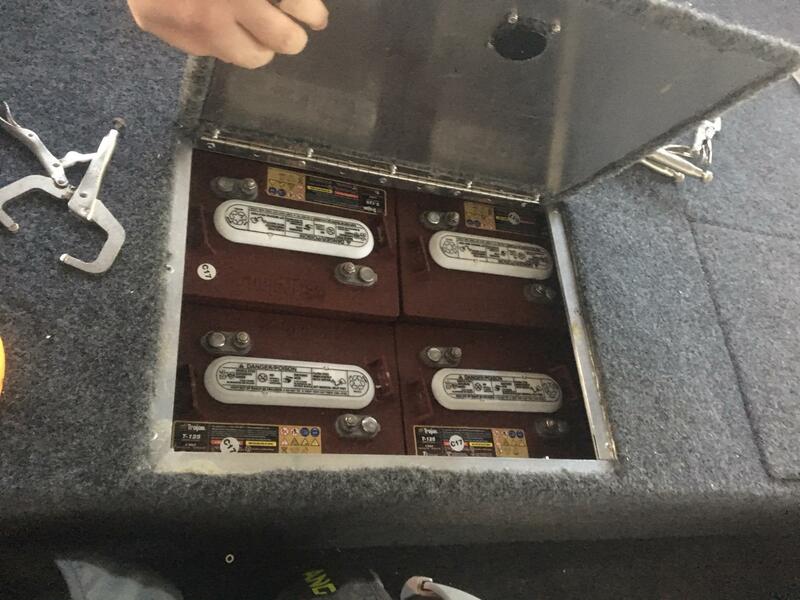 I just recently purchased a 48v Torqeedo and have to do the install of the batteries and steering console on my boat as well... I am contemplating getting it hooked up professionally or doing it myself, I am not sure where to start so maybe if you share some more updates with how you do yours I can mock that. 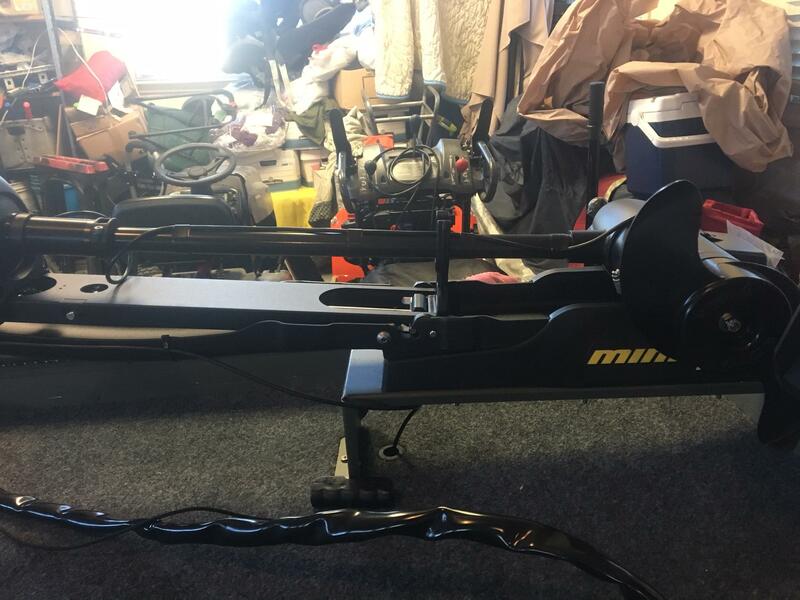 Any info you have would be great on the wiring/cables. Can't thank you enough for the comments and kind words, much appreciated. 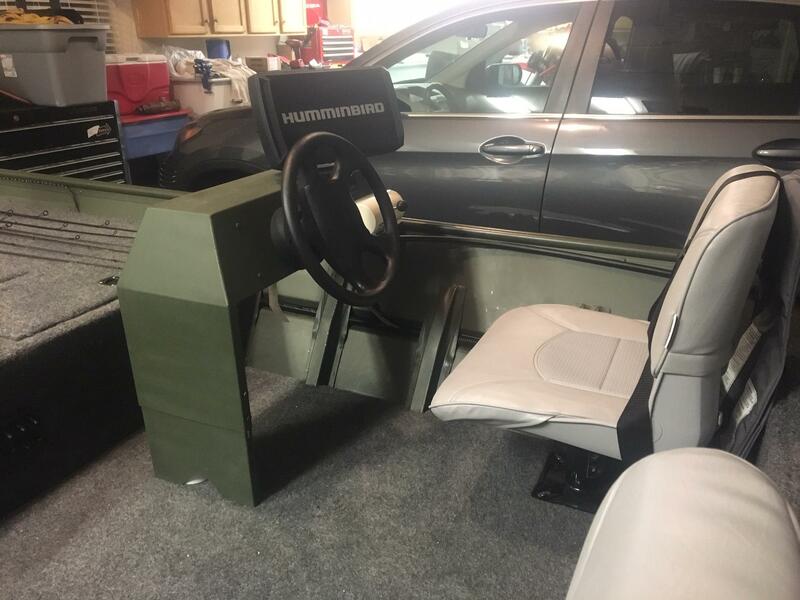 I am going to be doing the battery install and steering/console install in the next couple weeks. Anything I can offer to help you out, I am more than willing. 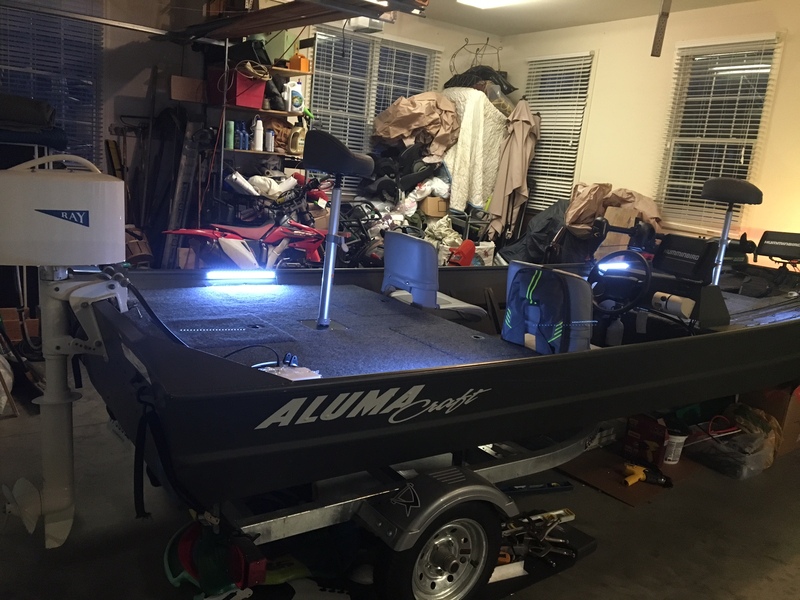 Oh, and I checked out your link for your build from last year... awesome build and slightly envious of that 1852, awesome size hull to start with. 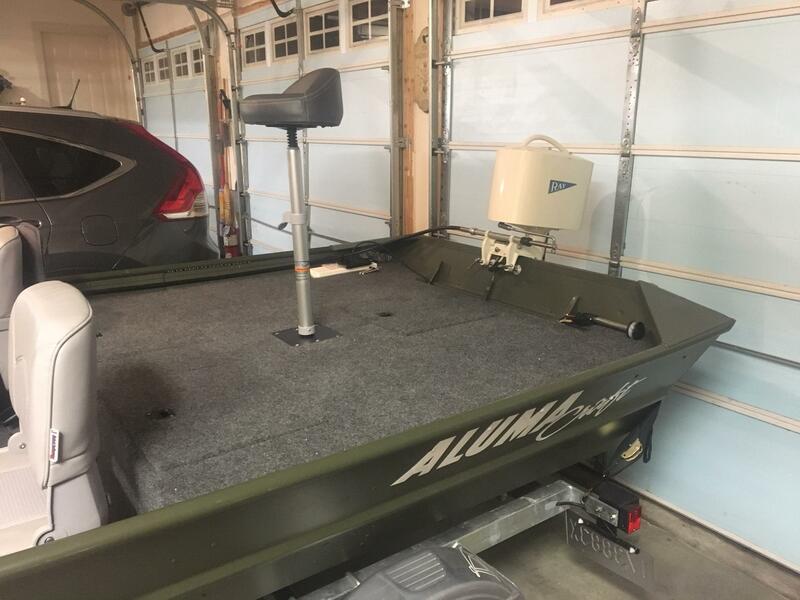 Alright, I have to get a lot done in a short amount of time to be fishing by the time the lakes open on March 1, knocked out the carpet and installation of components over this long weekend. Front deck next. 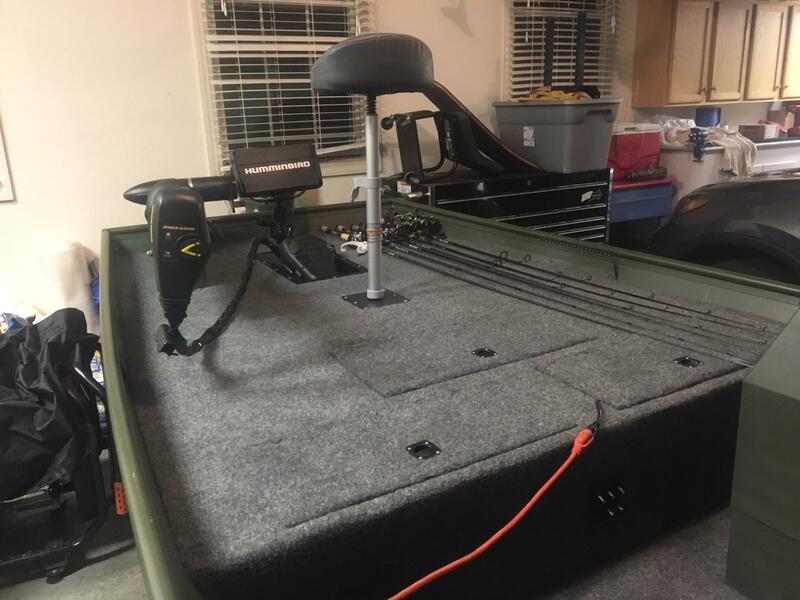 Decided to install everything(TM, Helix DI w/ RAM mount, pedestal seat base) instead of finishing the back deck carpet...it was getting late. Back deck carpet finished the next day, clothespins for areas having difficulty getting good adhesion. 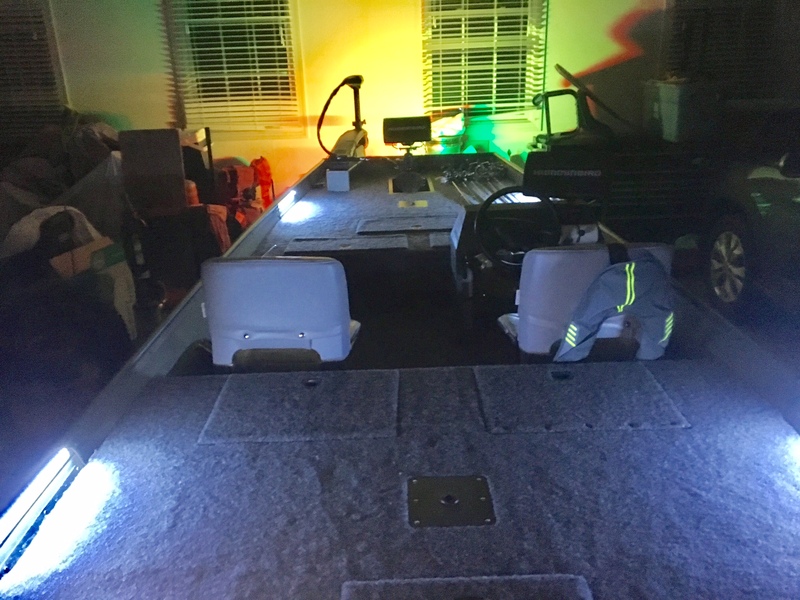 Pedestal seat base and stern nav light installed. 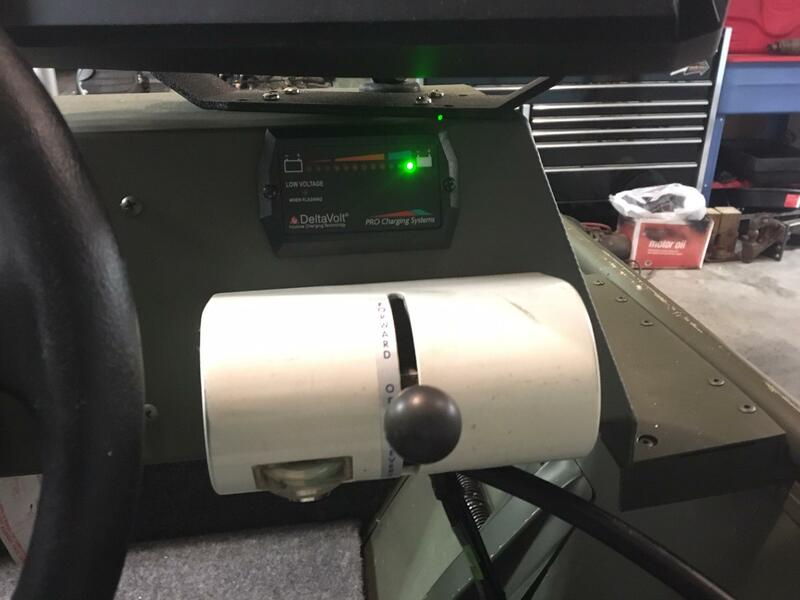 Rod saver strap installed and tested. 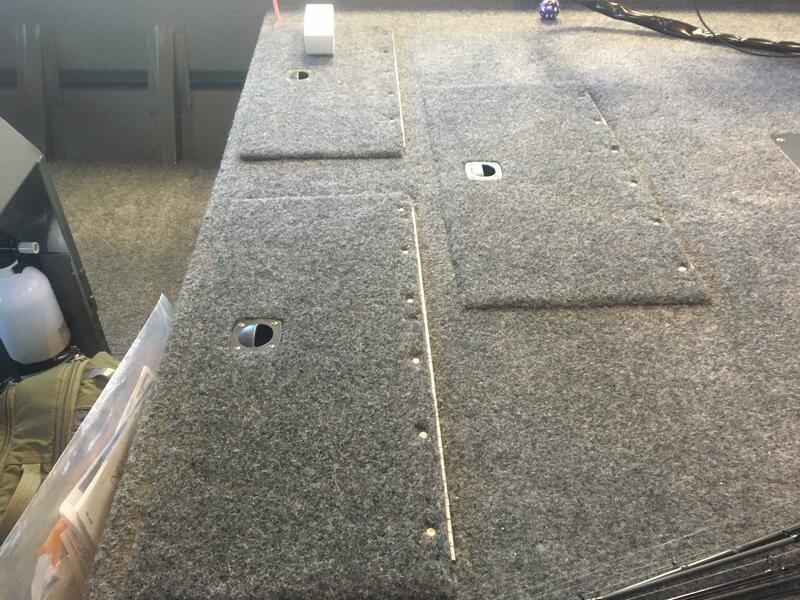 3) Hinge, carpet, install hatch lids. 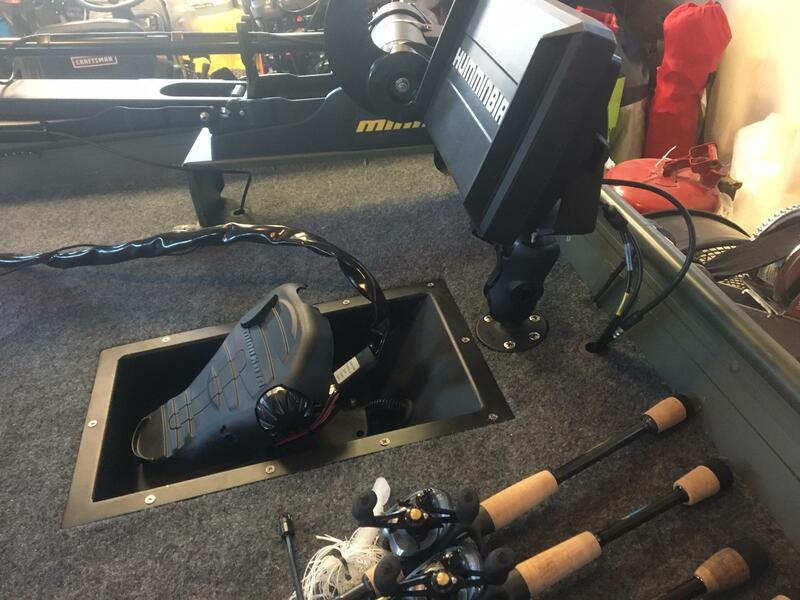 Also need to mount the transom tranducer block/mounting plate and the HD SI transducer itself, install the outboard and drill the mounting holes through the transom, mount the 3 bank on-board charger under the front deck somewhere. Paint job is far from perfect but good enough. After cleaning the bare aluminum with denatured alcohol, put down a couple coats of self-etching primer. Let that dry for about an hour, then went at it with the top coat. I used the 4 oz. touch paint can they gave me when I bought the hull. It was just barely enough. If I had more, I think I would sand and put another coat on. 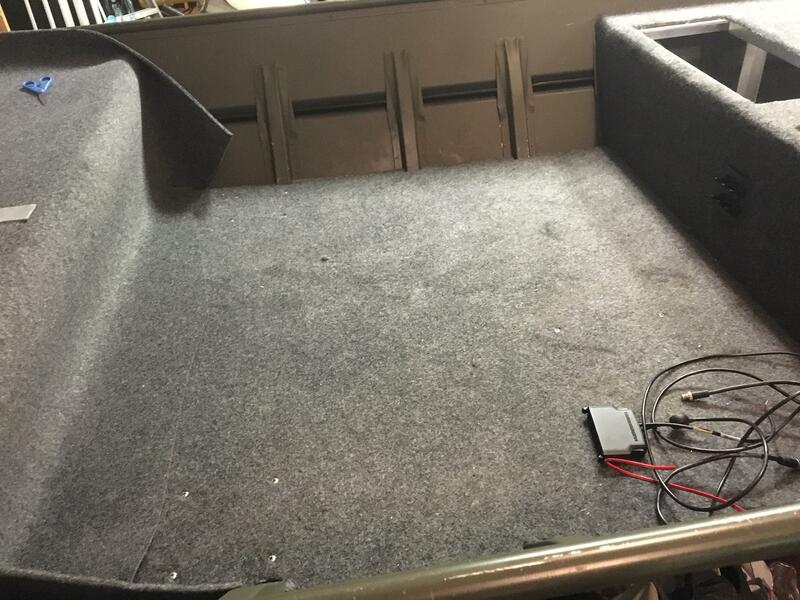 Carpeted and installed hatch lids and hinges. Also connected all my lights and 12v to the 12AH AGM battery I picked up. The not so good, and one part that I'm still not exactly thrilled with, is the hatch lids. I had to re-work the front hatch lids. As you can see in the image above, they weren't sitting correctly and too much resistance to open/didn't open far enough. This is a picture after re-doing the front hatches/hinging. I ended up covering the rivets with small circles of carpet, hard to see any difference now unless you know they are there or are looking real hard. After covering the rivets with carpet cutouts. 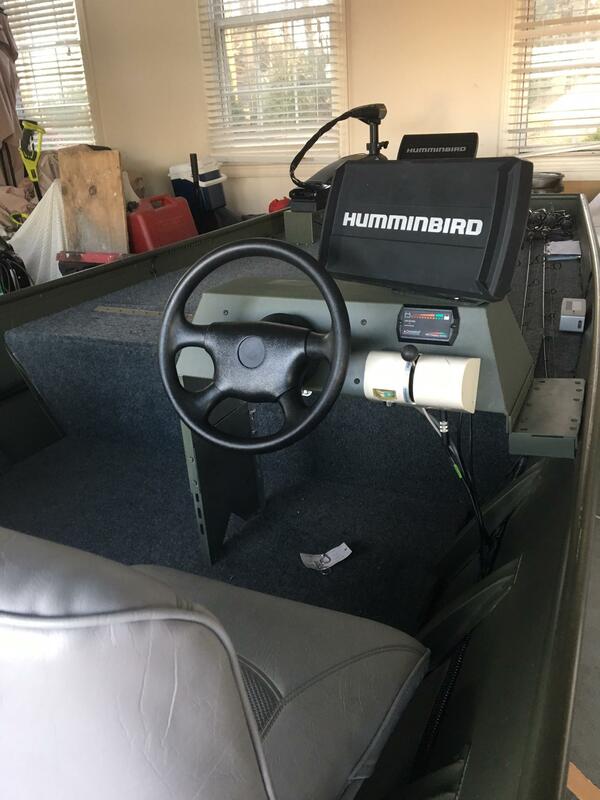 Installed the two 12 volt batteries for the 24 volt bow mount MinnKota Maxxum. 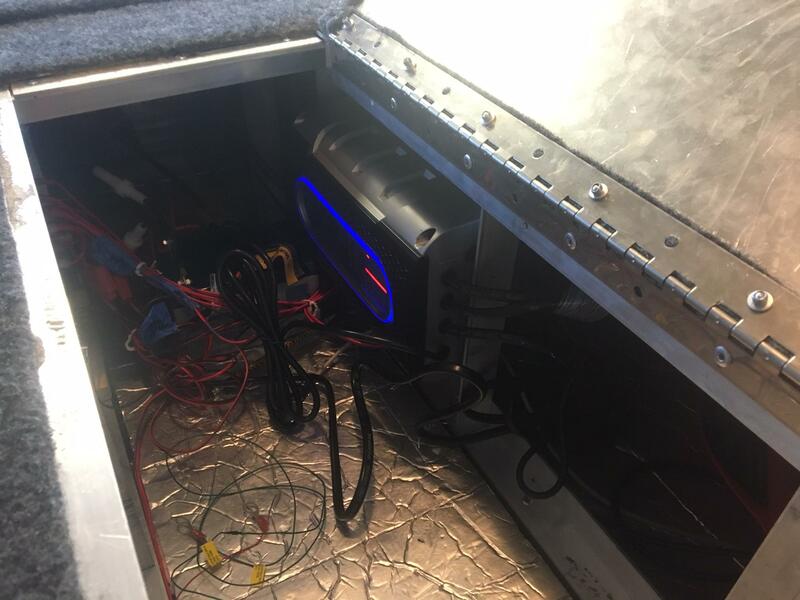 Also mounted the 3 bank on-board charger under the front deck. 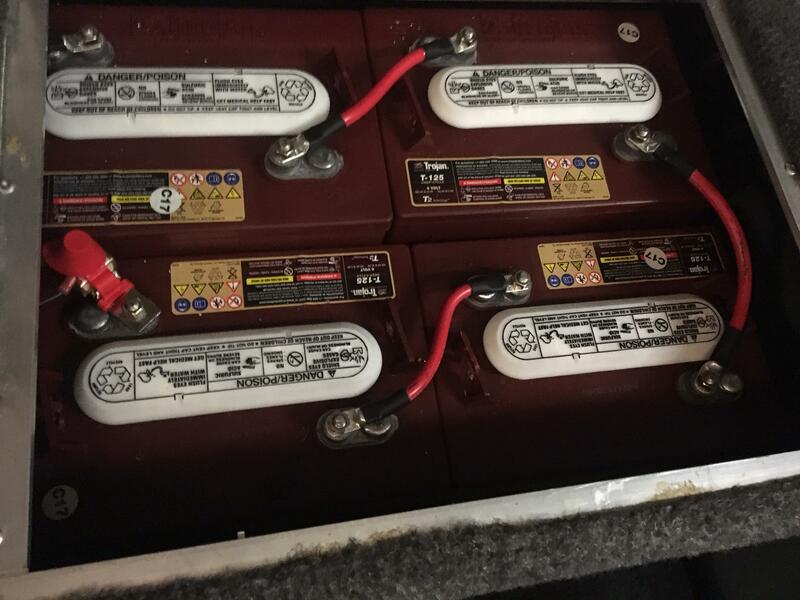 For the batteries, I went with 175AH from BassPro that were on sale for $99 each. Excuse the mess of wiring behind the charger, its since been cleaned up and re-terminated. 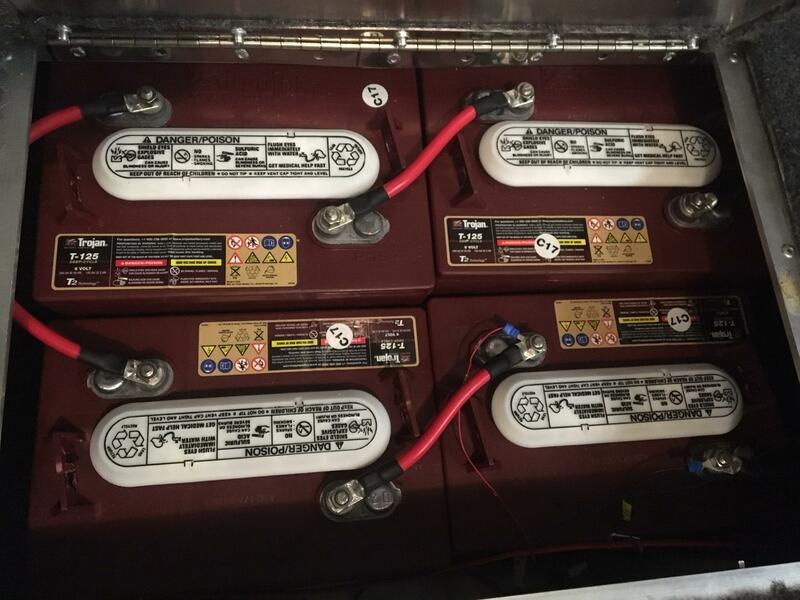 Went and picked up my x8 6volt T-125 Trojan Golf Cart Batteries. 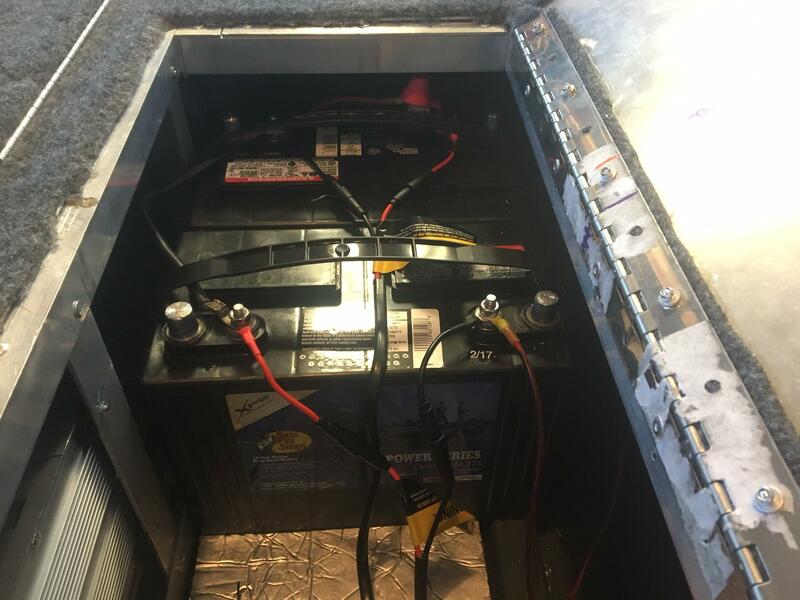 These are the highest Amp Hour batteries, 240 AH, I could fit under the back deck extension that was added to house the batteries for the outboard. Anything else was too tall.Thought it was going to be a puzzle fitting them under the deck but it turned out to be quite simple. Next step was wiring the 6volts up, in series. Bought my own 4awg cable, tinned copper lugs, heavy duty crimper and heat shrink. Cut each cable to size, crimped and heat shrink each lug. My positive lead supplying 48V has a battery terminal fuse rated for 50 volts and 150 amps. 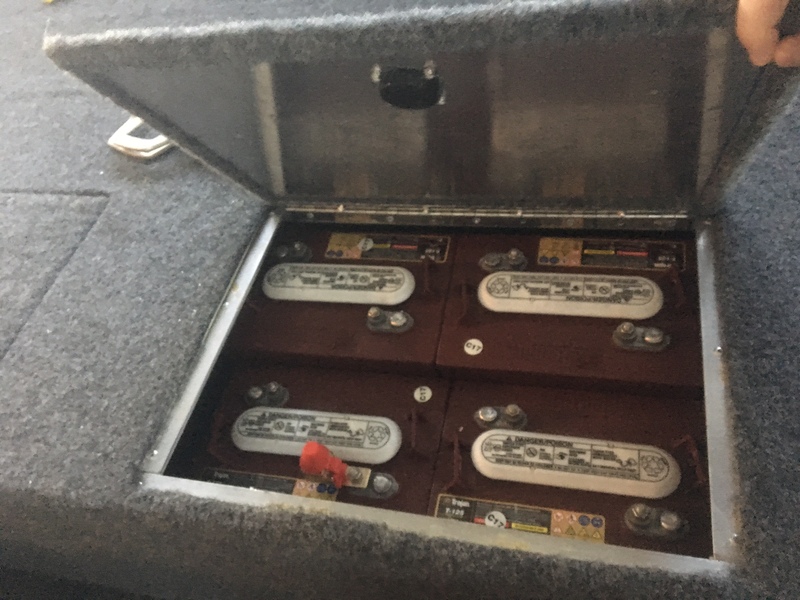 I also have a main cutoff switch, rated for 275 amps continuous, for the 48V bank, that is mounted in the far back compartment. The outboard was sitting at a funny angle so I played with the pin adjustment and now have it sitting essentially straight up and down, not with the prop leaning into the bottom of the transom like when I initially mounted it. 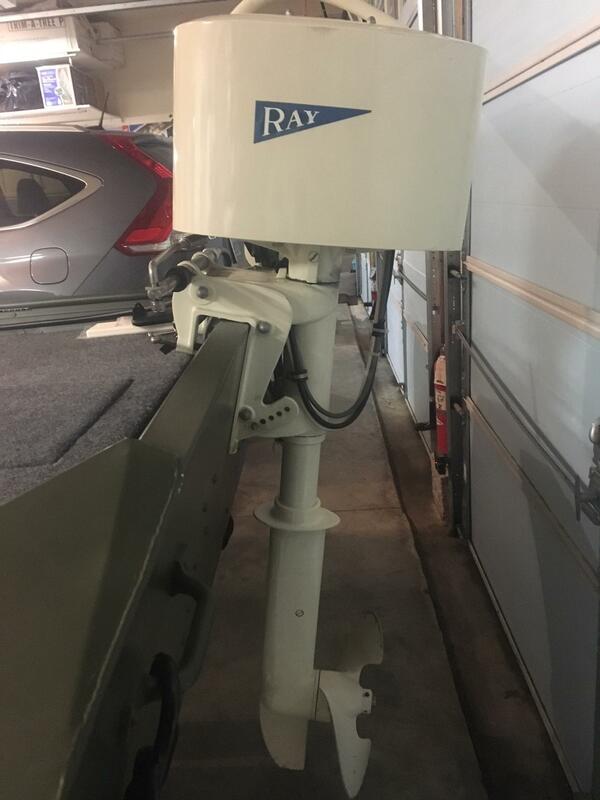 Does this look like the appropriate position/angle for the outboard? Last thing completed was getting the fuel gauge wired correctly and working. For the gauge there is a positive and negative lead and a green lead that goes on the battery terminal supplying the 48V's. I initially thought I'd be able to power the gauge off my 12v AGM and just have the green lead going to the 48V positive battery terminal. This was incorrect. I connected the positive and negative lead for the gauge to the terminals on the first battery in the 48v bank and am now getting accurate "fuel" gauge readings. -Fix my permit/registrations sticker b/c I'm a noob and put them in front of my registration numbers, not behind them. 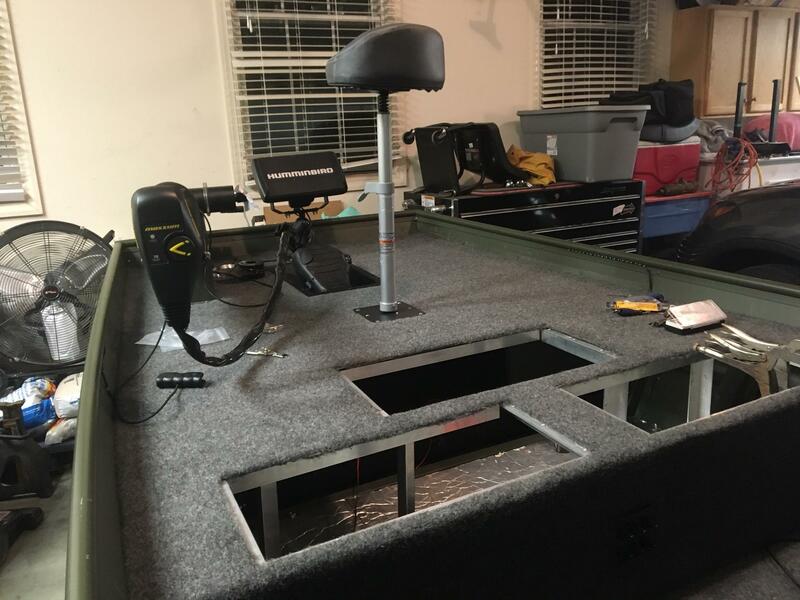 -Install the transducer mounting plate/board to the transom, then install the HDSI transducer. 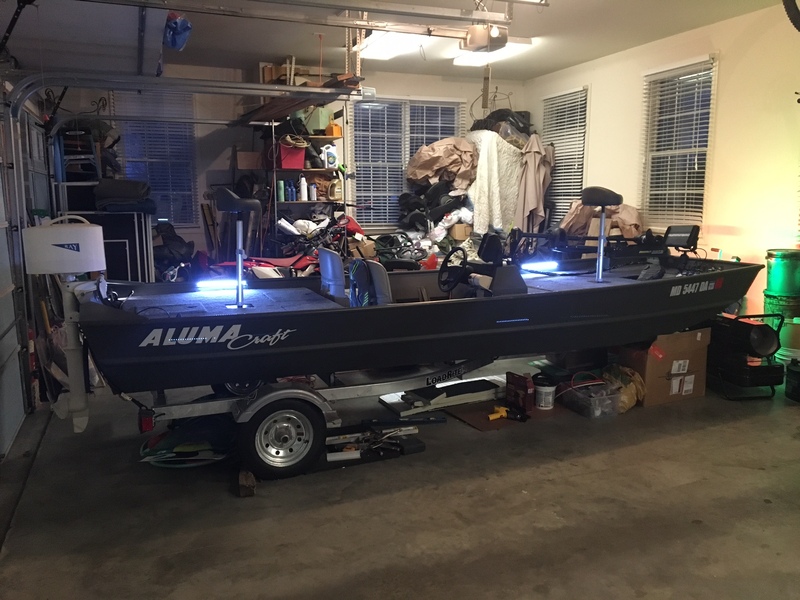 -Hope and pray for better/warmer weather here in Maryland so I can go test her out and...most important of all, go catch some fish!! 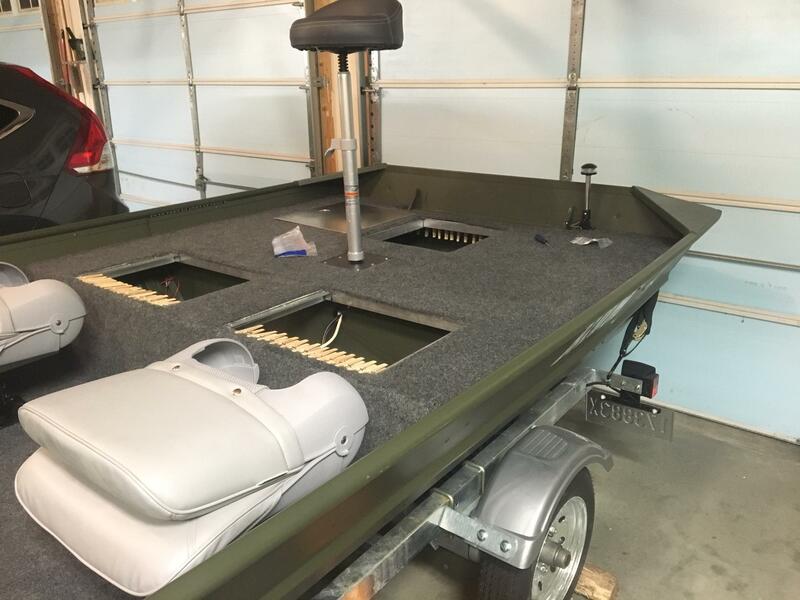 Would love to see a video of this boat in action! Very cool! Hoping to get it out tomorrow or next weekend. I'll try to remember to get some video while I'm out there. And GPS it please! I would like to know how fast it goes. Forgot video during my test run today, but I'll be sure to get some next time out. GPS on the Helix DI Unit said 6.0 MPH for top speed, but I was a little hesitant to go full throttle first time out, so may have a little room left for wide open. This was with two people, me and my father-in-law. I know this sounds like peanuts when you guys are talking about jet boats and all that do 25-30+MPH, but 6.0 MPH for my electric boat was actually better than I expected. I was told by the local professional electric boat builders to expect 4.0 MPH, maybe 5.0 with my hull. All in all, the test run was a success. I know this is an older thread, but I do have a question to ask. 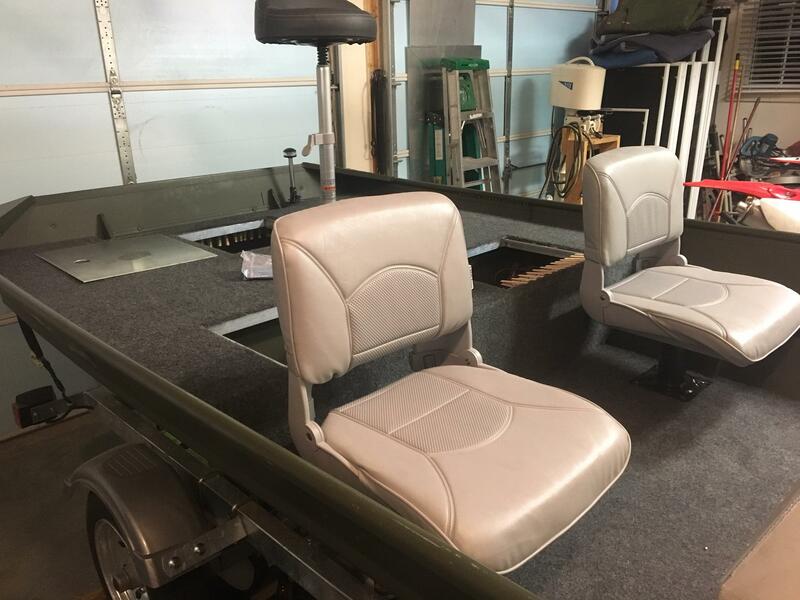 When you installed your stern seat did you do anything for additional support for the base? Or is it just attached to the bench? I ask because on my older boat I did that originally. But there was so much torque when you leaned back in the seat I was afraid that the seat base was going to rip up the aluminum on the bench seat. So I ended up cutting a hatch into and adding some bracing underneath the base and aluminum for extra support. Has it held up over time and not cause problems or have you had any issues with it? I'm not the OP, but I have the same hull. 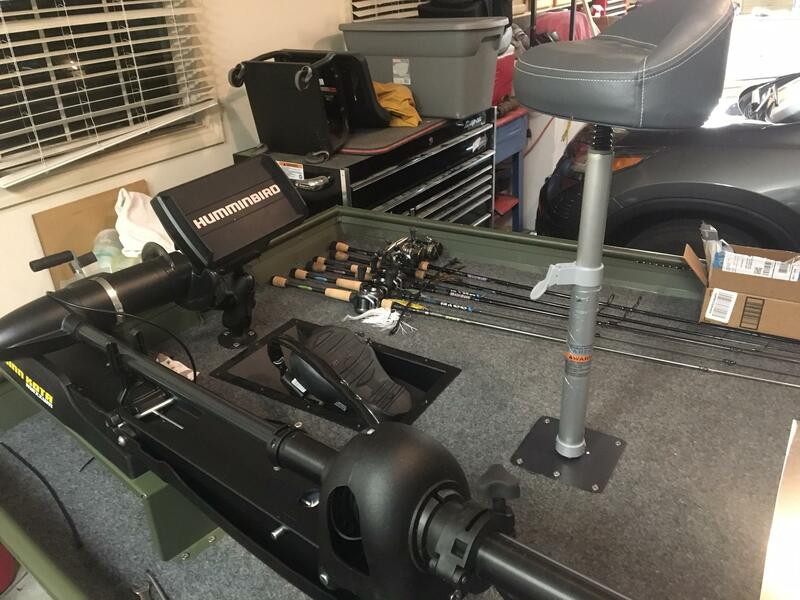 I mounted straight to the bench. There is 3/4" plywood underneath along with another layer of aluminum. Long sheet metal screws that go through the alum/wood/alum will hold it securely. It does flex a little more than the base on the front though....I believe the plywood in the rear does not extend all the way across the bow and is not secured like in the front. When I initially cut the middle hole for the seat base, the plywood underneath had some play and could be shifted in any direction maybe 1/2".